The villa is priced per week and is not per person. The minimum stay is 5 nights except in the high season when it is 7. Up to 6 adults can comfortably stay in the 3 double bedrooms however, it is possible for 4 adults and 4 children to stay. For this we will provide an extra two (camp) beds in the family bedroom (extra charge applicable). Cots and high chairs are also available free of charge. To arrange a booking or simply to enquire please email us at Sunsetvalley@btinternet.com. Longer lets may also be considered at a reduced rate by prior arrangement. Please contact us for availability as slots can become available at any time. If the special offers section is highlighted please email us for details. Please note that if the dates you require are not available but you want the location it may be possible to fit you in at another villa on the same site. Just email the required dates and I will let you know what is available. Top of the range Beefeater gas BBQ available to rent. So you now have a choice between a traditional charcoal BBQ or the convenience of gas. The gas BBQ can be rented for only £10 per week including the gas. Please enquire at the time of booking. 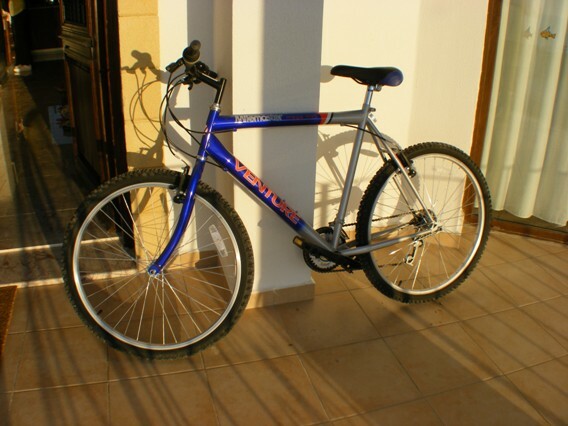 There are now 4 bicycles (two children's) that can be rented for £10ea per day or £30ea for the duration of your stay (even if staying for 2 weeks). 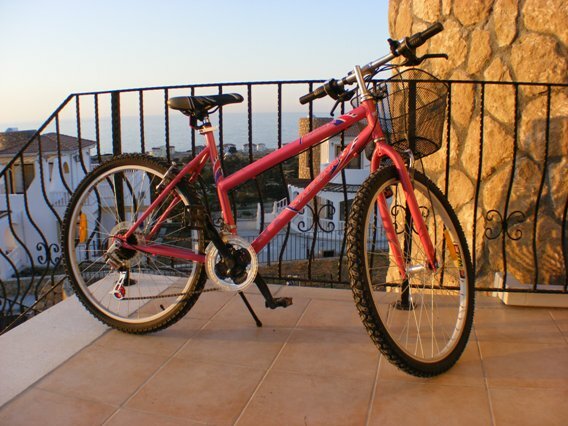 If two bicycles are rented it is £50 for the duration of your stay and £80 for all 4. View ladies bike; view gents bike. WiFi is now available in the villa. Due to the set up and running costs a charge will be levied at £10 per week. This ensures that the villa cost are kept down for those that don't require WiFi. There are many airlines that fly to the North or South. Transfers direct to the villa can be arranged from any airport. For your convenience car hire can be dropped off at the villa at no extra charge. Larnaca is the most convenient airport in the South. 25% of total charge is payable on booking. The balance is payable 8 weeks prior to departure. Receipt of all payments will be acknowledged by post and/or email. £200 per booking is payable with your balance against breakage’s or damage. This will be returned to you within 10 working days after the end of your stay, subject to satisfactory inspection by our property management team and deduction of any electricity charges if applicable (see below). In the event of cancellation it is always returned. Please note that if you are paying via PayPal any fees will be deducted from the deposit. We recommend that you take out adequate holiday insurance. A reminder will be sent for the balance and refundable security bond to be paid 8 weeks before departure. Should payment not be made in time then cancellation may be assumed resulting in loss of deposit and the property being re-let. In the unlikely event that the villa owner cancels the booking a full refund will be paid immediately to the client. No other liability will be accepted by the owner in respect of owner’s cancellation. Guests are strongly recommended to arrange comprehensive travel insurance to cover cancellation, ill health, personal belongings, public liability etc. The owner of the property and their representatives cannot be held responsible for any accident, injury, loss or damage howsoever caused. Sorry - the villa is strictly NO SMOKING. As a general rule the villa will be ready to occupy at 4pm on the day of your arrival and must be vacated at 11am on departure day. We are happy to be as flexible as possible with this depending on the arrival time of the next guests. The villa is self catering and as such there is no maid service. However extra cleans etc. can be arranged via the villa management company on arrival. Details in the villa. The number of guests to occupy each property will be limited to the maximum indicated and those paid for at the time of booking. Under no circumstances will any additional persons be permitted to stay unless by prior arrangement. Whilst staying in our villa please respect our neighbours, many of whom live there year round. Please remember that sound travels and is amplified due to the peacefulness of the area. Power and water supplies can be intermittent in Northern Cyprus. The owner of the property shall not be liable to the client for any defect or stoppage in the supply of public services. This includes WiFi and TV services. Use of the air conditioning is free of charge if used sensibly. Air conditioning is only effective in the villa when doors and windows are closed and will cool the room down very quickly. If doors and windows are open pedestal fans should be used to circulate the air. Under no circumstances should the air conditioning be left on if the villa is unoccupied as this is a waste of resources and bad for the environment. In an effort to safeguard this the first 300 units of electricity per week is free. Beyond this it will be chargeable at 0.30p per KWH unit of electricity. Meter readings will be taken at the start and end of your stay. Any electricity charges will be deducted from the security bond and the balance returned to you for the difference. When you arrive the villa will be clean with fresh towels laid out for each guest. The towels are for use in the villa and should not be used for the poolside or beach. Please leave the villa as you found it - if any extra cleaning is required over and above what is reasonable the cleaning company will charge extra. Any extra charge will be taken from the security bond. The owners and/or their representatives reserve the right to visit the property at any time to undertake essential or emergency repairs and to enter the premises during your absence from the property should an emergency arise. We have endeavoured to make the accommodation description as accurate as possible. However we cannot be held responsible for any changes made to the properties and surrounding area without our knowledge. All information and prices given are correct at the time of writing but may be subject to change and therefore should be taken as an indicator only. We cannot accept responsibility for the service received from third parties involved in your holiday, for example, airlines, insurance, car hire, airport transfers and management service of the properties even though they may have been recommended by us and/or booked by us on your behalf. Receipt of the deposit for your booking will be taken as your acceptance of our terms and conditions.